Even when I tried to give up, I couldn’t. I tried, but I kept pushing forward and encouraging myself. Sometimes it appeared as though I was so exhausted I was going to drop. But I knew I had to keep forging ahead. If you have ever had to do anything, you know what I’m talking about. 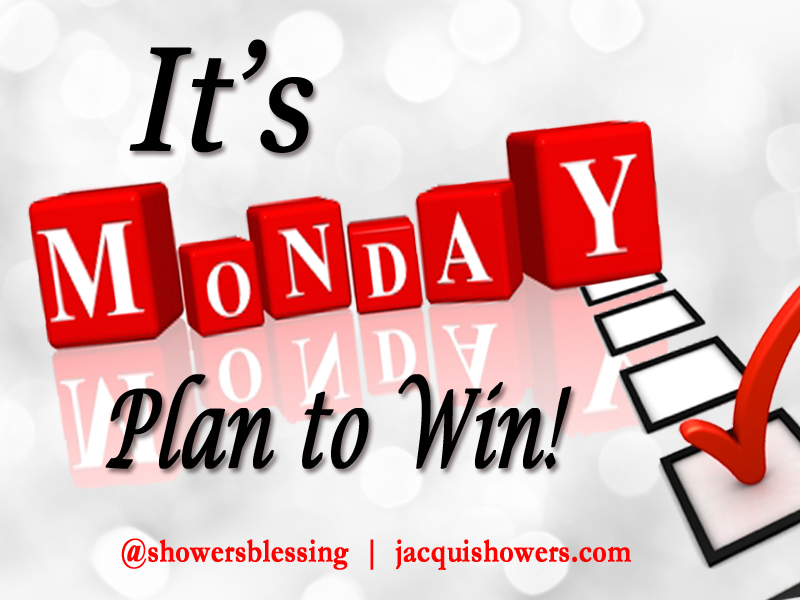 You know that it is not by your might or power, but by God’s spirit that propels you forward against all odds. That’s why giving up can never be an option. You will do whatever it takes to persevere. You must recognize those things that will cause you to want to give up. There has to be something that loosens you from the grips of mediocrity, complacency and passiveness to become diligent, assertive and passionate in your pursuit to go all the way. I push myself hard. I recognize that I can be consumed with perfectionism and never accomplish what I need to accomplish. I recognize it. There was a time when I didn’t want to recognize that it was a limitation that prevented me from being successful. Now, I confront it head on by calling it out and proactively operating with a spirit of excellence. How? I don’t have to have everything perfect—even if there was such a thing as perfection. Excellence provides me with an understanding that everything is a work in progress and along the way I can always go back and perfect it. I cannot give up on it. Howbeit, when excellence is at the forefront of my game, I push myself hard. I know that I am not operating within the finiteness of my own strength. That means, if I pull all-nighters and only get a few hours of sleep within a 48-72 hour period, so be it. It’s all worth it! You must be relentless in your assignment. Recognize those familiar foes that try to creep back into your life and cause you to stumble, fall and never get back up. Recognize new ones that try to blind sight you to give up. When you embrace the reality that every assignment given you has its own set of destiny busters, you will also be alert to their antics and thwart their assignment against your assignment. You won’t be so quick to give up. Do you easily cave in when the going gets tough? What is causing you to give up? What are you going to do not to give up? As you celebrate Martin Luther King’s birthday remember that we have a responsibility to humankind that extends beyond the boundaries of our existence to the greater good of society. As you walk out this day, remember the legacy of King and his commitment to love humanity, even sacrificing his own life. In today’s climate of divisiveness, know that each of us have been created to serve humankind with compassion and love. Hate against hate breeds hate. Love against hate breeds love. It is the strongest force in the world Love is more powerful than death. We must show love, even to those who do not show love. It is the legacy Martin Luther King Jr. left with us. Today we celebrate Dr. Martin Luther King Jr., who was committed to live out his purpose in service to humankind without fear of the consequences to his own life. As you kick-off your week in celebration of Dr. King’s life and legacy, be committed to rise above yourself in truly living out your dream of service to others by doing what is right regardless of its political, social or cultural consequences. These are 10 quotes by Dr. King to help you through your journey. 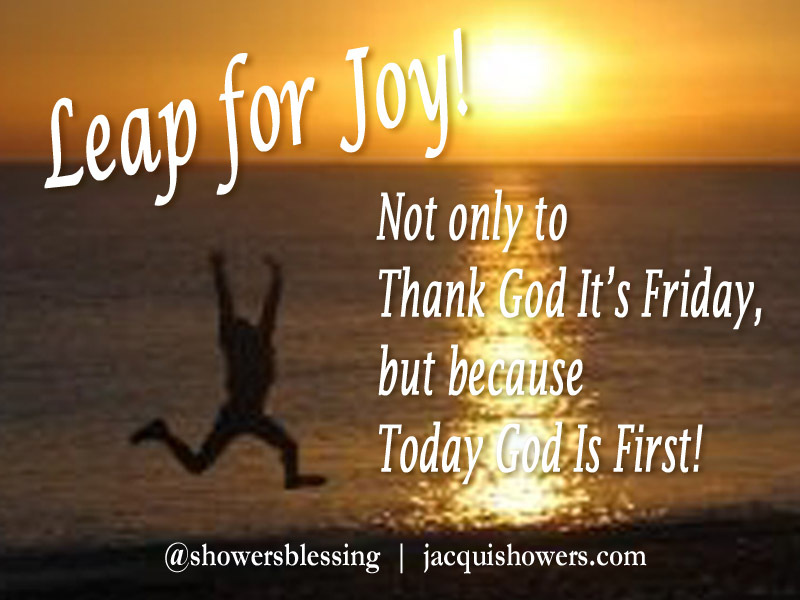 “The end of life is not to be happy, nor to achieve pleasure and avoid pain, but to do the will of God, come what may. Sounds like semantics to me. But it is not and you can easily think that you are operating in excellence when you are actually a perfectionist. If you always want things to be perfect and find yourself never completing anything, then you guessed it that is perfectionism. If you give it your very best and know when to release it that is excellence. Determine for yourself where you are. Many of us suffer from the debilitating limitations of perfectionism when we think we are actually exhibiting a spirit of excellence. You want everything to be perfect and you never complete anything. There is a difference between the two of them. Don’t get deceived there is a close alignment— however, one uplifts (excellence) and the other condemns (perfection). Striving for excellence you may sometimes fall short of your goal, but you don’t stay down. You get up, access your mistakes and keep moving forward. A perfectionist lives in constant condemnation, but when you strive for excellence you realize erasers were created because you would make some mistakes. It is called being human. Sometimes you may miss the mark, but you realize that you always have another chance to get it right. You must also recognize that there is a difference between striving to be perfect versus endeavoring to perform with excellence. Achieving perfection is an impossible task because it never makes allowances for errors or missteps. Consequently, condemnation and discouragement often follow one’s pursuit of perfection because these unrealistic expectations lead to feelings of worthlessness and inadequacy. The challenge is knowing when you have crossed over from performing with a spirit of excellence to operating in perfectionism. Perfectionism is fear-based and excellence is faith-based. Perfectionism always grips you with fear. You are always concerned that you never get it right. Consequently, you don’t even when you do because all you can see is the negative connotations and not the positive ones. 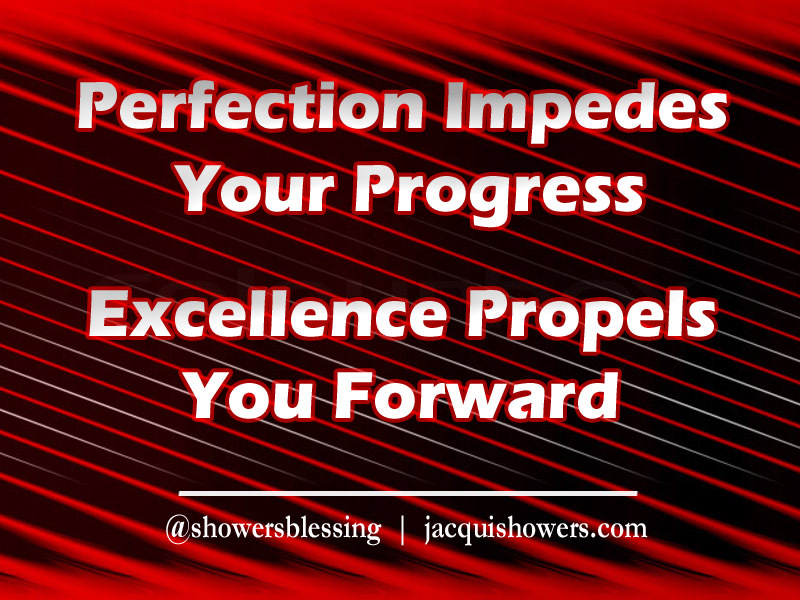 Perfectionism impedes your progress. Excellence propels and sets you a part for greatness. You no longer operate in a place of self-services, but you move into serving others. Recognizing the dichotomy of how these two forces operate enables you to move beyond the limitations of perfectionism and propel forward with the illimitable liberating spirit of excellence. How do you view yourself? Do you find yourself never completing tasks or feeling as though you never get right? Or, are you able to let it go and move on? Today we celebrate the life and legacy of Dr. Martin Luther King Jr. He was a man committed to serving others with excellence. 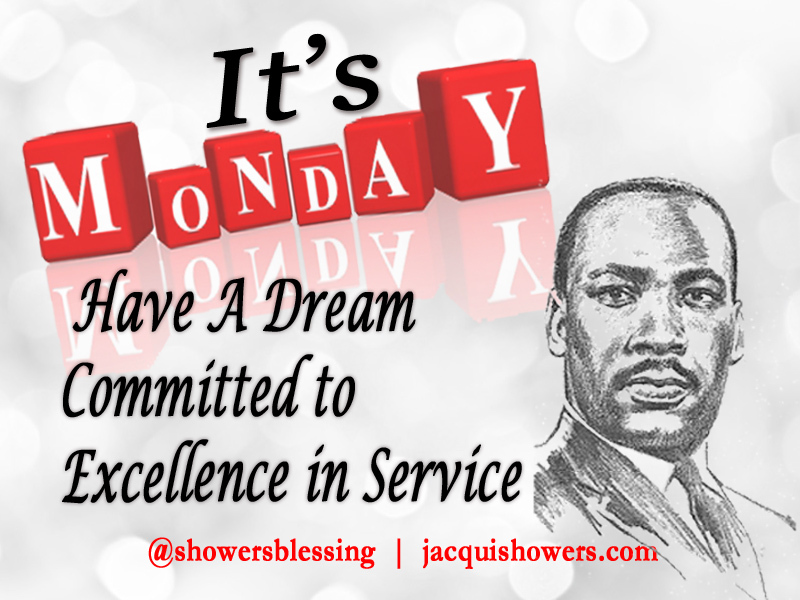 As you kick-off your week in celebration of Dr. King’s life and legacy, be committed to having a dream to serve others with excellence in everything you do.